Forensics 100 was simple forensics but still with some traps. Description: find the key, and they gave us the following file which revealed to be a gzipped raw disk image. 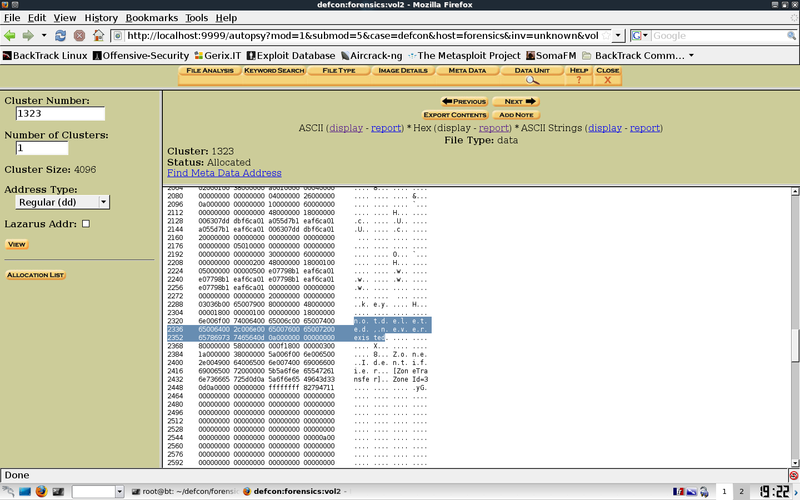 According to the values given by mmls, we can extract partitions with dd. Ok, it is clear: it is not here. All extracted files available here. carpenter.png seems an interesting picture of base64 text: we took some time to extract it with my teammate milo, played with it a bit, but found nothing. We find the ASCII comment Who is the author? and GPS coordinates leading us in China. We even spent some to find the same picture in Google Images to see if we can find some useful information, but nothing interesting. For that, I use my favourite tools: The Sleuth Kit with Autopsy browser, which I have already introduced in a previous posting about Codegate challenge #19. Same thing: we create a new case, a new host, add partition #2 and ready to start file analysis. 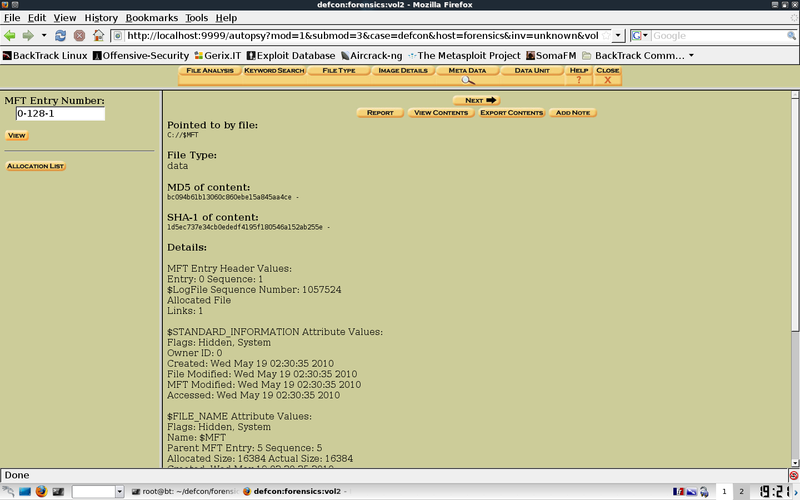 However NTFS has an interesting component: the Master File Table (MFT), shown in the NTFS filesystem as $MFT. Let's have a look at it because it may still contain portions of our deleted file. We could scroll the whole MFT in hex, but is rather big. A better thing to do is to see its metadata 0-128-1 (last column) and view the information from there. where the dots are null bytes (they may come from Unicode). Seems interesting, try it as a flag, first by adding spaces to make it correct: not deleted, never existed but it does not work, so try without spaces: notdeleted,neverexisted and CORRECT! You can find another good write-up of this challenge from Scott Wolchok, among others. 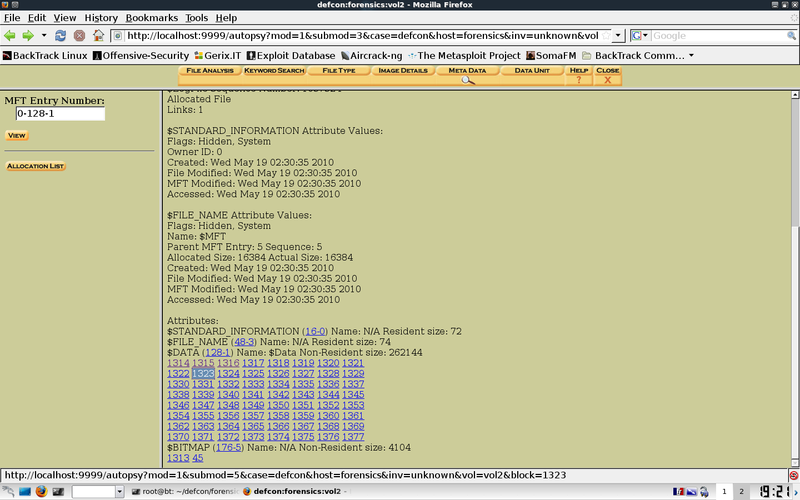 Did you see Scott Wolchok getting hacked at smpctf?